There’s a study that was done of food satiety (Holt SH, Miller JC, Petocz P, Farmakalidis E. A satiety index of common foods. Eur J Clin Nutr. 1995 Sep;49(9):675-90) (PDF). 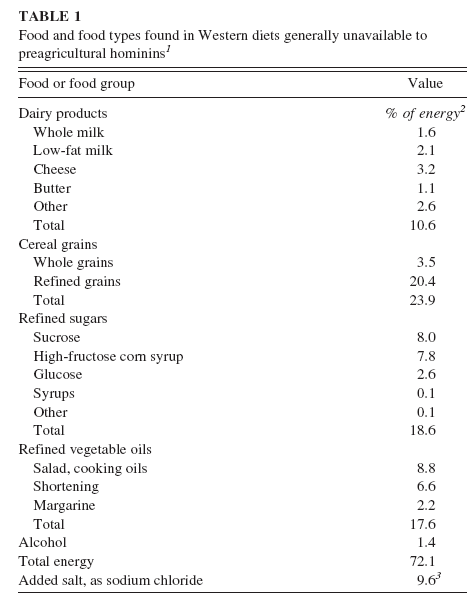 Isoenergetic 1000 kJ (240 kcal) servings of 38 foods separated into six food categories (fruits, bakery products, snack foods, carbohydrate-rich foods, protein-rich foods, breakfast cereals) were fed to groups of 11-13 subjects. Satiety ratings were obtained every 15 min over 120 min after which subjects were free to eat ad libitum from a standard range of foods and drinks. A satiety index (SI) score was calculated by dividing the area under the satiety response curve (AUC) for the test food by the group mean satiety AUC for white bread and multiplying by 100. Thus, white bread had an SI score of 100% and the SI scores of the other foods were expressed as a percentage of white bread. There were significant differences in satiety both within and between the six food categories. The highest SI score was produced by boiled potatoes (323 +/- 51%) which was seven-fold higher than the lowest SI score of the croissant (47 +/- 17%). Most foods (76%) had an SI score greater than or equal to white bread. The amount of energy eaten immediately after 120 min correlated negatively with the mean satiety AUC responses (r = -0.37, P < 0.05, n = 43) thereby supporting the subjective satiety ratings. SI scores correlated positively with the serving weight of the foods (r = 0.66, P < 0.001, n = 38) and negatively with palatability ratings (r = -0.64, P < 0.001, n = 38). Protein, fibre, and water contents of the test foods correlated positively with SI scores (r = 0.37, P < 0.05, n = 38; r = 0.46, P < 0.01; and r = 0.64, P < 0.001; respectively) whereas fat content was negatively associated (r = -0.43, P < 0.01). This goes a long way to explain the Kitavan diet which is largely sweet potatoes. Can you imagine eating sweet potatoes every day as a main staple? Even though they are high carbohydrates it would be tough to over eat them. Added: Gary Taubes takes on the palatable foods cause obesity theory (CATCHING UP ON LOST TIME – THE ANCESTRAL HEALTH SYMPOSIUM, FOOD REWARD, PALATABILITY, INSULIN SIGNALING AND CARBOHYDRATES… PART II(E, AS IN “END” AND “ENOUGH ALREADY”). Gary has some good points about the usefulness of this idea. The Paleo diet seeks to eliminate food which are not a part of our ancestral heritage. This paper presents a good defense of that position (Loren Cordain, S Boyd Eaton, Anthony Sebastian, Neil Mann, Staffan Lindeberg, Bruce A Watkins, James H O’Keefe, Janette Brand-Miller; Origins and evolution of the Western diet: health implications for the 21st century. The American Journal of Clinical Nutrition, Volume 81, Issue 2, 1 February 2005, Pages 341–354). Here’s the foods that are “new” to our diets. Eliminating these foods eliminates the diseases of modern civilization. Other than dairy and fruit this is consistent with the Low Carb diet. There’s a term, the “Cafeteria Diet” (CAF) that is used in research literature to describe a diet which is high in hyper-palatable food (described in the literature as “food regularly consumed by humans, including high‐salt, high‐fat, low‐fiber, energy dense foods such as cookies, chips, and processed meats“). These foods tend to be higher carbohydrate as well. There are quite a few studies which looked at CAF as the explanation for Metabolic Syndrome. Here’s one of the studies (Sampey, B. P., Vanhoose, A. M., Winfield, H. M., Freemerman, A. J., Muehlbauer, M. J., Fueger, P. T., Newgard, C. B. and Makowski, L. (2011), Cafeteria Diet Is a Robust Model of Human Metabolic Syndrome With Liver and Adipose Inflammation: Comparison to High‐Fat Diet. Obesity, 19: 1109-1117). The study looked at the difference between a high fat diet and the cafeteria diet. To investigate the obesogenic and inflammatory consequences of a cafeteria diet (CAF) compared to a lard‐based 45% HFD in rodent models, male Wistar rats were fed HFD, CAF or chow control diets for 15 weeks. Body weight increased dramatically and remained significantly elevated in CAF‐fed rats compared to all other diets. Glucose‐ and insulin‐tolerance tests revealed that hyperinsulinemia, hyperglycemia, and glucose intolerance were exaggerated in the CAF‐fed rats compared to controls and HFD‐fed rats. The two diets were both high fat compared with the control diet. Both of the high fat diets resulted in increased body fat. The difference was that the CAF diet caused inflammation in white fat. Although both high fat diets resulted in increased adiposity and hepatosteatosis, CAF‐fed rats displayed remarkable inflammation in white fat, brown fat and liver compared to HFD and controls. The study indicated that the CAF was a good model of Metabolic Syndrome. In sum, the CAF provided a robust model of human metabolic syndrome compared to traditional lard‐based HFD, creating a phenotype of exaggerated obesity with glucose intolerance and inflammation. This model provides a unique platform to study the biochemical, genomic and physiological mechanisms of obesity and obesity‐related disease states that are pandemic in western civilization today. This is interesting since the Diet Induced Obesity (DIO) models usually work in rats by feeding the rats a High Fat diet (HFD). The study concluded that the CAF diet was actually more effective at creating the Metabolic Syndrome than the High Fat Diet (HFD). Our study has revealed that rats fed human nutrient poor foods develop severe metabolic syndrome which is more robust than the effect of traditional HFD exposure. The power of these sorts of studies is that that were done on ad libitum fed rats. That is, they ate as much as they wanted to eat. They did not feed the rats a diet limited in any way. They simply presented the food and measured what was left to determine what the rats ate. This can’t be blamed on sugar since the Low Fat diet contained the most sugar. It can’t simply be blamed on carbohydrates although CAF had higher carbohydrates. …study revealed that while HFD-fed animals decreased food intake in terms of total grams to maintain caloric intake comparable to LFD and SC control, CAF-fed animals lacked this autoregulatory mechanism… CAF-fed rats were hyperphagic, eating 40% more calories/day compared to the HFD. Our study has revealed that rats fed human nutrient poor foods develop severe metabolic syndrome which is more robust than the effect of traditional HFD exposure. CAF-diet fed rats exhibited voluntary hyperphagia and grossly elevated fat intake which resulted in dramatic and rapid weight gain. Furthermore, CAF diet feeding promoted a prediabetic condition with elevated glucose, insulin, and nonesterified fatty acids, accompanied by decreased glucose and insulin tolerance. In addition, chronically inflamed liver and adipose tissues and distorted pancreatic islet architecture were prevalent. Author DougPosted on August 29, 2018 August 29, 2018 Categories UncategorizedLeave a comment on Cafeteria Diet? There’s a lot of contention about the carbohydrate-insulin-obesity (C-I-O) hypothesis to explain obesity. In my opinion, some of this can be traced to Gary Taubes’ abrasive personality. Gary is someone that a lot of people love to hate and he seems to like to help them hate him (Gary Taubes BLOG on this subject). One of the leading voices against C-I-O is Stephan Guyenet. His BLOG frequently takes on Gary Taubes and the C-I-O hypothesis. In this post he takes on one of the more reputable proponents of C-I-O (Testing the Insulin Model: A Response to Dr. Ludwig. Saturday, January 30, 2016). This [CICO] model seems to exist mostly to make lean people feel smug, since it attributes their leanness entirely to wise voluntary decisions and a strong character. Stephen provides a critique of the Carb-Insulin hypothesis that lists a large number of studies that provide evidence against the predictions that the C-I-O hypothesis generates. I will take some time in the future to look at his lines of evidence against C-I-O but my own interest in Low Carb was from the effect on T2 diabetes and not so much in obesity. Weight loss is just a nice side effect of Low Carb. I have struggled more with Low Carb to reach maintenance than I have with weight loss. I have no doubt that Low Carb works well for Type 2 diabetes. Whether or not the issue is the hormone Insulin or some other cause matters less to me than the effect. I think the evidence is that Low Carb does a better job at managing T2D without medications than either the Zone or Paleo diets. Stephen goes on to presents a third model to answer the basic questions. The increase of energy intake that has fueled the U.S. obesity epidemic is linked to greater availability of highly rewarding/palatable and energy-dense food. 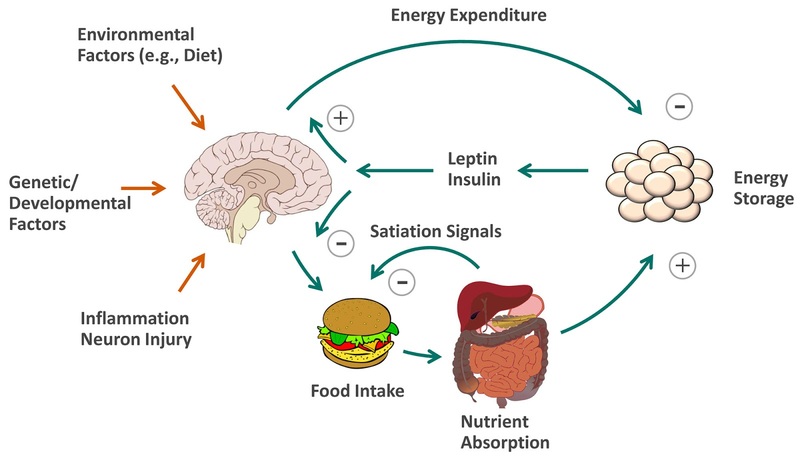 Obesity occurs in genetically susceptible individuals and involves the biological defense of an elevated body fat mass, which may result in part from interactions between brain reward and homeostatic circuits. Inflammatory signaling, accumulation of lipid metabolites, or other mechanisms that impair hypothalamic neurons may also contribute to the development of obesity and offer a plausible mechanism to explain the biological defense of elevated body fat mass. This is where Low Carb can work well since it eliminates these highly palatable food. However, Stephen doesn’t see a particular advantage to Low Carbohydrate diets. Among various scientific rationales that have been advanced for such diets is that excessive insulin secretion induced by rapidly digested carbohydrate foods causes a subsequent, transient fall of plasma glucose levels; this, in turn, triggers excess feeding and ultimately causes obesity. …. Although clinical trials have established that reduced carbohydrate diets can safely induce modest long-term weight loss, the mechanisms typically advanced to explain this benefit have little in the way of experimental support and are not informative with respect to the control of food intake. I think there’s something to the fall of blood sugar stimulating hunger. The reason I think that’s true is that it is my experience. I get hungry a few hours after eating a protein meal. Stephen’s explanation is that it is because my stomach is emptying and sending a signal to the brain. It would be interesting to note the difference in someone with a different reaction to protein meals. This theory is old and is presented here (Jean Mayer. Glucostatic Mechanism of Regulation of Food Intake. N Engl J Med 1953; 249:13-16). Today, modern agricultural practices and modern food processing have dumped a massive quantity of refined carbohydrates (sugar and flour) and refined fats (oils) into the food supply, creating protein and nutrient dilution. Because humans eat to a tightly regulated protein and micronutrient satiety drive, we frequently overeat empty calorie carbs and fats just to get adequate protein and micronutrients. Ludwig produced a paper recently ( Ludwig David S, et.al. The Carbohydrate-Insulin Model of Obesity: Beyond “Calories In, Calories Out”. JAMA Intern Med. 2018 Aug 1;178(8):1098-1103). See Ludwig’s earlier response to Guyunet (Defense of the Carbohydrate-Insulin Model Redux: A Response to Kevin Hall). The Paleo diet is a close cousin to the Low Carb diet. The Paleo and Low Carb diets are both elimination diets (they say to not eat particular things) and many of the things that they eliminate are in common. The Paleo diet is based on the idea that our genetics were formed in the Paleolithic Period. This is the time period before agriculture. Man was largely a hunter/gatherer in our long developing history. Thus, the Paleo diet eliminates grains since they are largely the product of agriculture. The Low Carb diet also eliminates grains but it is because they are concentrated forms of carbohydrates. Paleo is based on an ancestral/evolutionary philosophy. The idea is that man has developed over millions of years. Natural selection is the process which has eliminated and honed man down to the specific biological machines that we are. Eating food which was consistent with what we ate over that long period makes more sense than eating Fruit Loops. The Biblical story is often placed in contrast to this point of view. In the Bible Adam and Eve are placed into a garden to tend the garden. There are indications in the text that the original order was not consuming animal products. After the flood story man is told Noah is to eat animals. The human earliest conflict in the Bible is between the brothers Cain and Abel – farmer and a herdsman. The farmer brings a sacrifice from his crops and God is displeased. The herdsman slaughters an animal and his sacrifice pleases God. Thus, the evidence in the Bible is that both are very early modes. For either the evolutionary or Biblical view, processed food is very recent in our history. We are not well adapted to these processed foods. Eating natural foods fits well into either paradigm. The wheat/bread in Bible times is not like our flour/Wonder Bread products of today. The refining process eliminates protective elements, like fiber, from the raw food. Refining/processing concentrates carbohydrates into a more dense form. Imagine something like fudge in nature – you can’t find an equivalent thing. The only really sweet things in nature, like honey are pretty well protected. Even sugar cane is fairly low in sugar. It’s when it is processed into powder form that it becomes dense and separated from fiber. Studies have been done which show good results with Paleo diets (Tommy Jönsson. A Paleolithic diet confers higher insulin sensitivity, lower C-reactive protein and lower blood pressure than a cereal-based diet in domestic pigs. Nutrition & Metabolism, 2006;Nov 2, v3.1, p 39). This study in domestic pigs suggests that a Paleolithic diet conferred higher insulin sensitivity, lower C-reactive protein and lower blood pressure when compared to a cereal based diet. Not that we want skinny pigs. The issue of life expectancy is given as an argument against the Paleo diet. After all cavemen, they say, died at early ages. Much of the reason for early death is due to accident or bacterial infection. There is evidence that there was very little heart disease in our Paleolithic ancestors. Man has a very limited ability to store carbohydrates directly in the body. We store dietary carbohydrates in the form of glycogen which we have about a day’s worth of stores. Excessive protein, carbohydrates and fat get stored in our body which can take us through many weeks/months of food shortage. It is rare in our world to face extended shortages of food. Even our poor are rarely hungry. Animal products are quickly perishable and refrigeration is a relatively new invention which extends this time. Carbohydrates, in the form of grains, can be stored for very long times. It is interesting that the ability of our bodies to store food is the opposite of the storage capabilities of food. After agriculture came into prominence, wheat got more people through famines. Paleo typically doesn’t include dairy products (THE PLACE OF DAIRY ON A PALEO DIET). Low Carb diets typically include dairy although some people find the high fat nature of dairy products can slow weight loss. The Paleo diet includes fruit. A possible criticism of some implementations of the Paleo diet is that Paleolithic man would have only had access to fruit in short seasons and in limited forms. It is noteworthy that the more north the less fruits are available both in variety and season length. My raspberry bush produces black raspberries every year. The entire plant provides a very limited number of berries. I can’t practically access most of the berries since the plant has barbs that protect many of the berries. For some reason bugs don’t bother the plant. I eat the berries when they come in season and I will eat all of the berries I can harvest from my one very large plant. I eat them every day or two. It’s not all that many grams of carbs total and they taste great. But the season when the berries are there is really short here in SW PA. There’s large seeds in the berries and probably a good amount of fiber. It takes 4 ozs of the berries to get 17g of carbohydrates and I never get anywhere near that much in a single day (Nutritional Value of Black Raspberries). I don’t know if this is a natural plant or one that someone deliberately planted in the past. It’s in the corner of my backyard. The exception to seasonal limits may be tropical regions where food like bananas have been more widely available over wider time frames (Banana Tree Harvesting – Learn How And When To Pick Bananas). To make the point though, bananas just entered the North American diet after the Civil War (Wikipedia). It hasn’t been long in terms of our history that we could get bananas any day of the week and for a couple of pounds per dollar and bananas certainly weren’t a part of my own Northern European ancestry. The Low Carb diet eliminates nearly all fruit due to the high carbohydrate load. There is no accommodation for seasonality in Low Carb. Both sides have learned from each other. It is possible to eat Low Glycemic foods on Paleo. The Low Carb community has taken some of the criticisms about excess fat consumption from the Paleo community. Some Low Carb folks have found dairy to be problematic and adopted a hybrid approach to their diet. I looked earlier (Glycogen Stores – Why does it matter?) at this study (K J Acheson Y Schutz T Bessard K Anantharaman J P Flatt E Jéquier. Glycogen storage capacity and de novo lipogenesis during massive carbohydrate overfeeding in man. The American Journal of Clinical Nutrition, Volume 48, Issue 2, 1 August 1988, Pages 240–247). The purpose of the study was to look at body glycogen stores. As part of the study they compared several diets. These diets were performed as a glycogen depletion/repletion strategy. The study shows the relatively short term weight loss on each diet (Low Carb High Fat, [overfed] High Carb Low Fat, and Protein Sparing Modified Fast diets). Mean body weight decreased by 0.8 ± 1.4 kg during the 3 d on the restricted, high-fat, low-carbohydrate diet. After the 7 d of overfeeding the high-carbohydrate, low-fat diet (day 10), body weight had increased by 4.6 ± 1 .3 kg (ie, 5.6, 4.9, and 3.2 kg). During the 2 d on the restricted high-protein, low-energy diet (600 kcal/ d) 4.4 ± 0.9 kg were lost. Carbohydrates make us fat. Seems like this shouldn’t be a controversial point, but it is in some areas. This study on carbohydrate overfeeding fed people 2.5 times their energy expenditure as carbohydrates (Aarsland A, Chinkes D, Wolfe RR. Hepatic and whole-body fat synthesis in humans during carbohydrate overfeeding. Am J Clin Nutr. 1997 Jun;65(6):1774-82). We conclude that the liver plays a quantitatively minor role when surplus carbohydrate energy is converted into fat in the human body. The main site for fat synthesis is likely to be the adipose tissue. The respiratory exchange ratio (RER) was 0.81 +/- 0.01 in the basal state and 0.99 +/- 0.025 and 1.15 +/- 0.022 on days 1 and 4, respectively. Although there was net fat oxidation in the basal state (955 +/- 139 mg.kg-1.min-1), there was net fat synthesis at the whole-body level both during early (day 1; 481 +/- 205 mg.kg-1.min-1) and late (day 4; 2243 +/- 253 mg.kg-1.min-1) carbohydrate overfeeding. Although hepatic secretion of fat synthesized de novo increased approximately 35-fold during the study (basal state, 1.0 +/- 0.3; day 1, 13.8 +/- 6.8; and day 4, 43.3 +/- 16.3 mg.kg-1.min-1) this could only account for a small portion of total fat synthesis. After 4 d of high-carbohydrate feeding, net fat synthesis at the whole body level was ~2250 mg /kg /d (ie, ~170 g/d). Thus, adaptation to a hyperenergetic carbohydrate diet involved a substantial increase in de novo lipid biosynthetic activity. However, at this time the liver produced ~40 mg fat – kg – d ‘ (ie, ~3 g/d). Although this value was 50-fold greater than the basal rate, hepatic de novo synthesis of fat only accounted for 2% of whole-body fat synthesis after 4 d of hyperenergetic carbohydrate feeding. Most likely, the adipose tissue had adapted to the high carbohydrate load by synthesizing 167 g fat/d. This study puts it nicely (Flatt JP. Use and storage of carbohydrate and fat. Am J Clin Nutr. 1995 Apr;61(4 Suppl):952S-959S). The body’s glycogen stores are so small that regulatory mechanisms capable of efficiently adjusting carbohydrate oxidation to carbohydrate intake have developed through evolution. Fat oxidation is regulated primarily by events pertaining to the body’s carbohydrate economy, rather than by fat intake. Adjustment of fat oxidation to intake occurs because cumulative errors in the fat balance lead oven time to changes in adipose tissue mass, which can substantially alter free fatty acid concentration, insulin sensitivity, and fat oxidation. Fat intake and habitual glycogen concentnations are important in determining how fat one has to be to oxidize as much fat as one eats. Because the fraction of total dietary energy provided by protein is relatively small and relatively constant, and because the body spontaneously maintains a nearly constant protein content by adjusting amino acid oxidation to amino acid intake, body weight maintenance is primarily determined by the intake and utilization of carbohydrate and fat. Glucose uptake and glycogen synthesis are greatly stimulated by insulin, the secretion of which increases when blood glucose concentrations rise. Two moles ATP are expended to incorporate 1 mol glucose into glycogen. Because 36 ATP are gained during the complete oxidation of one molecule of glucose, 2/36, or ~5% of the energy content of glucose must be expended to store it as glycogen. Glycogen storage fits the bill as the storage element for short term requirements. The energy density of glycogen stores is thus only 4.2 kJ/g (~1 kcal/g), imposing definite limits on the amount of energy that can conveniently be carried in the form of glycogen. Glycogen concentrations are highest in the liver, ie, typically ~4% after an overnight fast, and up to 8% after meals. Because an adult’s liver weighs ~1.5 kg, hepatic glycogen storage capacity is limited to ~120 g. Glycogen amounts in muscle are much lower and deliberate carbohydrate loading is necessary to raise them much above 2%. However, because muscle accounts for 20-30% of total body weight, the amount of glycogen stored in muscle is generally three to four times that in the liver. Total glycogen stones in adults can thus be estimated to be ~200-500 g, depending on body size and on the amount of carbohydrate consumed, and vary substantially during the day as a function of food intake and exertion. The body’s glycogen reserve is in effect not much greater than the amount of carbohydrate usually consumed in 1 d, and maintenance of glycogen amounts within a desirable range requires effective adjustment of carbohydrate oxidation to carbohydrate intake. Fat stands in contrast to glycogen stores which only store 1 kcal per gram (3/4 of the weight is water). Fat is stored without water and is stored at about 8 kcal per gram. The following explains the details of the conversion of carbohydrates to fat. The massive expansion of the glycogen stores then leads to the nearly exclusive use of glucose as a fuel (as shown in Figure 1 by the fact that the RQ remains close to 1.0 for many hours), in time reducing such temporary accumulations of glycogen. To induce substantial rates of carbohydrate conversion into fat, the body’s total glycogen stores must be considerably raised, from their usual 4-6 g/kg body wt to > 8-10 g/kg body wt. This requires deliberate and sustained ovenconsumption of large amounts of carbohydrates for ~2-3 d.
Fat gets handled differently in that it gets stored. When we eat fat we don’t burn more fat. Fortunately this is the case since we’d be in real trouble on a low carbohydrate diet since we don’t have the large amount of glycogen stores as our dietary buffers as someone who eats (buffers) a lot of carbohydrates. …fat ingestion has so little effect on postprandial substrate oxidation is imputable to the relatively slow rate of fat absorption from the gut and to the fact that dietary fat is converted into chylomicrons targeted for deposition in adipocytes, allowing only a small fraction to reach other cells in the form of free fatty acids. Thus, although carbohydrate intake has a powerful effect in promoting carbohydrate oxidation, ingestion of fat promotes fat oxidation only marginally, so that even the consumption of high fat meals leads to inhibition of fat oxidation during the following hours. Eat more fat, burn less body fat. There’s an interesting book which describes the capture of frontier folks by American Indians in the frontier era. Often these captives were adopted by their Indian captors to replace family members who had died. In some cases, the captives later refused to return to European American communities when they had the opportunity. There’s a book which collects together many of their experiences (Captured by the Indians: 15 Firsthand Accounts, 1750-1870. Edited by Frederick Drimmer, 1961). The book recounts the diet of the North American Indians and the adaptation of people who were on European diets to the diets of the Indians. The Indians relied largely on animals for their food. The European captives seem to have suffered the equivalent of the ketogenic flu when they adapted to the Indian diet. They describe a couple of rough days at the start when they abruptly ceased to eat the European diet. There were definite differences in diet. For example, the Europeans were used to bread at all of their meals but the Indians ate meat alone. From p 27. This is as simple as the idea that the Indians were largely nomadic in the summer. They built shelters in the winter and stayed at those locations. 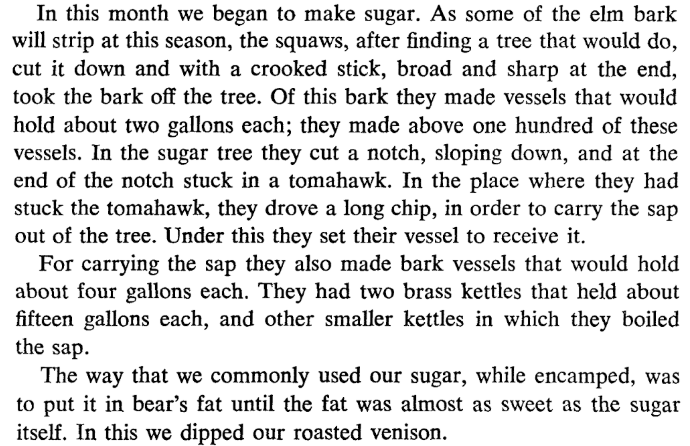 There are some very specific details such as this account of cooking a bear (p. 39). See this article for more information on the dietary habits of American Indians (Guts and Grease: The Diet of Native Americans). 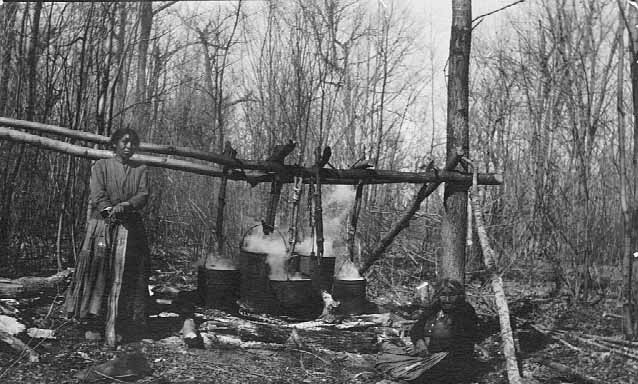 For carbohydrates the women among the Indians tapped trees for sap and then concentrated the sap by heating it in bronze pots. They would dip their meat in the syrup. Here is the account of how they made syrup. I wonder if the Indians had bronze kettles prior to the European arrival? Wikipedia indicates that there was no bronze objections created in North America prior to the European arrival. For more information on this subject see (Introduction to Contact and Precontact Period Copper & Brass Metalwork). The Indians seemed to be aware that they needed both fat and carbohydrates to gain needed weight. There is plenty of evidence in the book that the Indians had extended times without any food (p. 40). There is an account of how they would run down horses by chasing after them for miles (p. 42). It was easier to track them when there was a little snow on the ground. Women took care of the corn and men hunted. There is an account of where the men would mock their European captives who helped the women with the corn (p. 43). The standard Oral Glucose Tolerance Test (OGTT) does not measure first phase insulin response. To measure that it would be necessary to look at blood sugar at 30 minutes after the meal. There’s a study which makes this point (Hulman, et.al. Glucose patterns during an oral glucose tolerance test and associations with future diabetes, cardiovascular disease and all-cause mortality rate. Diabetologia. 2018 Jan;61(1):101-107.). Elevated 30 min glucose is associated with increased risk of diabetes and all-cause mortality rate independent of fasting and 2 h glucose levels. Therefore, subgroups at high risk may not be revealed when considering only fasting and 2 h glucose levels during an OGTT. This subject is covered in this review (Cheng K, et.al. First phase insulin secretion and type 2 diabetes. Curr Mol Med. 2013 Jan;13(1):126-39.). Pancreatic β-cells secrete insulin in a biphasic manner, first and second phase insulin secretion, and loss of first phase insulin secretion is an independent predictor of T2D onset.